The gray whale (Eschrichtius robustus), also known as the grey whale, gray back whale, Pacific gray whale, or California gray whale, is a baleen whale that migrates between feeding and breeding grounds yearly. It reaches a length of 14.9 meters (49 ft), a weight of 36 tonnes (40 short tons), and lives between 55 and 70 years. The common name of the whale comes from the gray patches and white mottling on its dark skin. Gray whales were once called devil fish because of their fighting behavior when hunted. The gray whale is the sole living species in the genus Eschrichtius, which in turn is the sole living genus in the family Eschrichtiidae. This mammal descended from filter-feeding whales that appeared at the beginning of the Oligocene, over 30 million years ago. The gray whale is distributed in an eastern North Pacific (North American), and an endangered western North Pacific (Asian), population. North Atlantic populations were extirpated (perhaps by whaling) on the European coast before AD 500, and on the American coast around the late 17th to early 18th centuries. Even so, on May 8, 2010, a sighting of a gray whale was confirmed off the coast of Israel in the Mediterranean Sea, leading some scientists to think they might be repopulating old breeding grounds that have not been visited for centuries. In May and June 2013, a gray whale was sighted off the coast of Namibia – the first confirmed in the Southern Hemisphere. The round-trip journey of one gray whale has set a new record for the longest mammal migration, covering a distance of more than 22,000 kilometres across the Pacific Ocean. Her migration has shown new insight into how endangered species are making drastic changes in their life style. The gray whale is traditionally placed as the only living species in its genus and family, Eschrichtius and Eschrichtiidae, but an extinct species was discovered and placed in the genus in 2017, the Akishima whale (E. akishimaensis). Some recent DNA analyses have suggested that certain rorquals of the family Balaenopteridae, such as the humpback whale, Megaptera novaeangliae, and fin whale, Balaenoptera physalus, are more closely related to the gray whale than they are to some other rorquals, such as the minke whales. But other recent studies place gray whales as being outside the rorqual clade, but as the closest relatives to the rorquals. John Edward Gray placed it in its own genus in 1865, naming it in honour of physician and zoologist Daniel Frederik Eschricht. The common name of the whale comes from its coloration. The subfossil remains of now extinct gray whales from the Atlantic coasts of England and Sweden were used by Gray to make the first scientific description of a species then surviving only in Pacific waters. The living Pacific species was described by Cope as Rhachianectes glaucus in 1869. Skeletal comparisons showed the Pacific species to be identical to the Atlantic remains in the 1930s, and Gray's naming has been generally accepted since. Although identity between the Atlantic and Pacific populations cannot be proven by anatomical data, its skeleton is distinctive and easy to distinguish from that of all other living whales. Many other names have been ascribed to the gray whale, including desert whale, devilfish, gray back, mussel digger and rip sack. The name Eschrichtius gibbosus is sometimes seen; this is dependent on the acceptance of a 1777 description by Erxleben. The gray whale has a dark slate-gray color and is covered by characteristic gray-white patterns, scars left by parasites which drop off in its cold feeding grounds. Individual whales are typically identified using photographs of their dorsal surface and matching the scars and patches associated with parasites that have fallen off the whale or are still attached. They have two blowholes on top of their head, which can create a distinctive heart-shaped blow at the surface in calm wind conditions. Gray whales measure from 4.9 m (16 ft) in length for newborns to 13–15 m (43–49 ft) for adults (females tend to be slightly larger than adult males). Newborns are a darker gray to black in color. A mature gray whale can reach 40 t (44 short tons), with a typical range of 15–33 t (17–36 short tons). Notable features that distinguish the gray whale from other mysticetes include its baleen that is variously described as cream, off-white, or blond in color and is unusually short. Small depressions on the upper jaw each contain a lone stiff hair, but are only visible on close inspection. Its head's ventral surface lacks the numerous prominent furrows of the related rorquals, instead bearing two to five shallow furrows on the throat's underside. The gray whale also lacks a dorsal fin, instead bearing 6 to 12 dorsal crenulations ("knuckles"), which are raised bumps on the midline of its rear quarter, leading to the flukes. This is known as the dorsal ridge. The tail itself is 3–3.5 m (10–11 ft) across and deeply notched at the center while its edges taper to a point. The two populations of Pacific gray whales (east and west) are morphologically and phylogenically different. Other than DNA structures, differences in proportions of several body parts and body colors including skeletal features, and length ratios of flippers and baleen plates have been confirmed between Eastern and Western populations, and some claims that the original eastern and western groups could have been much more distinct than previously thought, enough to be counted as subspecies. Since the original Asian and Atlantic populations have become extinct, it is difficult to determine the unique features among whales in these stocks. However, there have been observations of some whales showing distinctive, blackish body colors in recent years. This corresponds with the DNA analysis of last recorded stranding in China. Differences were also observed between Korean and Chinese specimens. Two Pacific Ocean populations are known to exist: one of not more than 130 individuals (according to the most recent population assessment in 2008) whose migratory route is presumed to be between the Sea of Okhotsk and southern Korea, and a larger one with a population between 20,000 and 22,000 individuals in the eastern Pacific traveling between the waters off northernmost Alaska and Baja California Sur. Mothers make this journey accompanied by their calves, usually hugging the shore in shallow kelp beds, and fight viciously to protect their young if they are attacked. The western population has had a very slow growth rate despite heavy conservation action over the years, likely due to their very slow reproduction rate. The state of the population hit an all-time low in 2010, when no new reproductive females were recorded, resulting in a minimum of 26 reproductive females being observed since 1995. Even a very small number of additional annual female deaths will cause the subpopulation to decline. However, as of 2018, evidence has indicated that the western population is markedly increasing in number, especially off Sakhalin Island. Following this, the IUCN downlisted the population's conservation status from critically endangered to endangered. The gray whale became extinct in the North Atlantic in the 18th century. Other than speculations, large portions of historical characteristic of migration and distribution are unclear such as locations of calving grounds, existences of resident groups, and occurrences within Black and Azov Seas. They had been seasonal migrants to coastal waters of both sides of Atlantic, including the Baltic Sea, Wadden Sea, the Gulf of St. Lawrence, the Bay of Fundy, Hudson Bay (possibly), and Pamlico Sound. Radiocarbon dating of subfossil or fossil European (Belgium, the Netherlands, Sweden, the United Kingdom) coastal remains confirms this, with whaling the possible cause. Remains dating from the Roman epoch were found in the Mediterranean during excavation of the antique harbor of Lattara near Montpellier, France in 1997, raising the question of whether Atlantic gray whales migrated up and down the coast of Europe from Wadden Sea to calve in the Mediterranean. A 2018 study utilizing ancient DNA barcoding and collagen peptide matrix fingerprinting confirmed that Roman era whale bones east of the Strait of Gibraltar were gray whales (and North Atlantic right whales), confirming that gray whales once ranged into the Mediterranean. Similarly, radiocarbon dating of American east coastal subfossil remains confirm that gray whales existed there at least through the 17th century. This population ranged at least from Southampton, New York, to Jupiter Island, Florida, the latest from 1675. In his 1835 history of Nantucket Island, Obed Macy wrote that in the early pre-1672 colony a whale of the kind called "scragg" entered the harbor and was pursued and killed by the settlers. A. B. Van Deinse points out that the "scrag whale", described by P. Dudley in 1725 as one of the species hunted by the early New England whalers, was almost certainly the gray whale. Researchers used a genetic approach to estimate pre-whaling abundance based on samples from 42 California gray whales, and reported DNA variability at 10 genetic loci consistent with a population size of 76,000–118,000 individuals, three to five times larger than the average census size as measured through 2007. NOAA has collected surveys of gray whale population since at least the 1960s. They state that "the most recent population estimate [from 2007] was approximately 19,000 whales, with a high probability (88%) that the population is at 'optimum sustainable population' size, as defined by the Marine Mammal Protection Act. They speculate that the ocean ecosystem has likely changed since the prewhaling era, making a return to prewhaling numbers infeasible. Factors limiting or threatening current population levels include ship strikes, entanglement in fishing gear, and changes in sea-ice coverage associated with climate change. Several whales seen off Sakhalin and on Kamchatka Peninsula are confirmed to migrate towards eastern side of Pacific and join the larger eastern population. In January 2011, a gray whale that had been tagged in the western population was tracked as far east as the eastern population range off the coast of British Columbia. Recent findings from either stranded or entangled specimens indicate that the original western population have become functionally extinct and possibly all the whales appeared on Japanese and Chinese coasts in modern times are vagrants or re-colonizers from the eastern population. In mid-1980, there were three gray whale sightings in the eastern Beaufort Sea, placing them 585 kilometers (364 mi) further east than their known range at the time. Recent increases in sightings are confirmed in Arctic areas of the historic range for Atlantic stocks, most notably on several locations in the Laptev Sea including the New Siberian Islands in the East Siberian Sea, and around the marine mammal sanctuary of the Franz Josef Land, indicating possible earlier pioneers of re-colonizations. These whales were darker in body color than those whales seen in Sea of Okhotsk. In May 2010, a gray whale was sighted off the Mediterranean shore of Israel. It has been speculated that this whale crossed from the Pacific to the Atlantic via the Northwest Passage, since an alternative route around Cape Horn would not be contiguous to the whale's established territory. There has been gradual melting and recession of Arctic sea ice with extreme loss in 2007 rendering the Northwest Passage "fully navigable". The same whale was sighted again on May 30, 2010, off the coast of Barcelona, Spain. In May 2013, a gray whale was sighted off Walvis Bay, Namibia. Scientists from the Namibian Dolphin Project confirmed the whale's identity and thus provides the only sighting of this species in the Southern Hemisphere. Photographic identification suggests that this is a different individual than the one spotted in the Mediterranean in 2010. As of July 2013, the Namibian whale was still being seen regularly. Genetic analysis of fossil and prefossil gray whale remains in the Atlantic Ocean suggests several waves of dispersal from the Pacific to the Atlantic related to successive periods of climactic warming - during the Pleistocene before the last glacial period and the early Holocene immediately following the opening of the Bering Strait. This information and the recent sightings of Pacific gray whales in the Atlantic, suggest that another range expansion to the Atlantic may be starting. A whale swims nearby Santa Monica Mountains. Breeding behavior is complex and often involves three or more animals. Both male and female whales reach puberty at approximately eight years of age. Females show highly synchronized reproduction, undergoing oestrus in late November to early December. During the breeding season, it is common for females to have several mates. This single ovulation event is believed to coincide with the species’ annual migration patterns, when births can occur in warmer waters. Most females show biennial reproduction, although annual births have been reported. Males also show seasonal changes, experiencing an increase in testes mass that correlates with the time females undergo oestrus. Currently there are no accounts of twin births, although an instance of twins in utero has been reported. The gestation period for gray whales is approximately 13 ​1⁄2 months. In the latter half of the pregnancy, the fetus experiences a rapid growth in length and mass. Similar to the narrow breeding season, most calves are born within a six-week time period in mid January. The calf is born tail first, and measures about 4 m (13 ft) in length. Females lactate for approximately seven months following birth, at which point calves are weaned and maternal care begins to decrease. The shallow lagoon waters in which gray whales reproduce are believed to protect the newborn from sharks and orcas. On 7 January 2014, a pair of newborn or aborted conjoined twin grey whale calves were found dead in the Laguna Ojo de Liebre (alias Scammon’s Lagoon), off the west coast of Mexico. They were joined by their bellies. The whale feeds mainly on benthic crustaceans, which it eats by turning on its side and scooping up sediments from the sea floor. This unique feeding selection makes gray whales one of the most strongly reliant on coastal waters among baleen whales. It is classified as a baleen whale and has baleen, or whalebone, which acts like a sieve, to capture small sea animals, including amphipods taken in along with sand, water and other material. Mostly, the animal feeds in the northern waters during the summer; and opportunistically feeds during its migration, depending primarily on its extensive fat reserves. Calf gray whales drink 190–300 US gal (720–1,140 l) of their mothers' 53% fat milk per day. The main feeding habitat of the western Pacific subpopulation is the shallow (5–15 m (16–49 ft) depth) shelf off northeastern Sakhalin Island, particularly off the southern portion of Piltun Lagoon, where the main prey species appear to be amphipods and isopods. In some years, the whales have also used an offshore feeding ground in 30–35 m (98–115 ft) depth southeast of Chayvo Bay, where benthic amphipods and cumaceans are the main prey species. Some gray whales have also been seen off western Kamchatka, but to date all whales photographed there are also known from the Piltun area. Predicted distribution models indicate that overall range in the last glacial period was broader or more southerly distributed, and inhabitations in waters where species presences lack in present situation, such as in southern hemisphere and south Asian waters and northern Indian Ocean were possible due to feasibility of the environment on those days. Range expansions due to recoveries and re-colonization in the future is likely to be happen and the predicted range covers wider than that of today. Each October, as the northern ice pushes southward, small groups of eastern gray whales in the eastern Pacific start a two- to three-month, 8,000–11,000 km (5,000–6,800 mi) trip south. Beginning in the Bering and Chukchi seas and ending in the warm-water lagoons of Mexico's Baja California Peninsula and the southern Gulf of California, they travel along the west coast of Canada, the United States and Mexico. Traveling night and day, the gray whale averages approximately 120 km (75 mi) per day at an average speed of 8 km/h (5 mph). This round trip of 16,000–22,000 km (9,900–13,700 mi) is believed to be the longest annual migration of any mammal. By mid-December to early January, the majority are usually found between Monterey and San Diego such as at Morro bay, often visible from shore. The whale watching industry provides ecotourists and marine mammal enthusiasts the opportunity to see groups of gray whales as they migrate. By late December to early January, eastern grays begin to arrive in the calving lagoons and bays on the west coast of Baja California Sur. The three most popular are San Ignacio, Magdalena Bay to the south, and, to the north, Laguna Ojo de Liebre (formerly known in English as Scammon's Lagoon after whaleman Charles Melville Scammon, who discovered the lagoons in the 1850s and hunted the grays). Gray whales once ranged into Sea of Cortez and Pacific coasts of continental Mexico south to the Islas Marías, Bahía de Banderas, and Nayarit/Jalisco, and there were two modern calving grounds in Sonora (Tojahui or Yavaros) and Sinaloa (Bahia Santa Maria) until being abandoned in 1980s. These first whales to arrive are usually pregnant mothers looking for the protection of the lagoons to bear their calves, along with single females seeking mates. By mid-February to mid-March, the bulk of the population has arrived in the lagoons, filling them with nursing, calving and mating gray whales. Throughout February and March, the first to leave the lagoons are males and females without new calves. Pregnant females and nursing mothers with their newborns are the last to depart, leaving only when their calves are ready for the journey, which is usually from late March to mid-April. Often, a few mothers linger with their young calves well into May. By late March or early April, the returning animals can be seen from Puget Sound to Canada. A gray whale swims near surf on Nootka Island within residential range. A population of about 200 gray whales stay along the eastern Pacific coast from Canada to California throughout the summer, not making the farther trip to Alaskan waters. This summer resident group is known as the Pacific Coast feeding group. Any historical or current presence of similar groups of residents among the western population is currently unknown, however, whalers' logbooks and scientific observations indicate that possible year-round occurrences in Chinese waters and Yellow and Bohai basins were likely to be summering grounds. Some of the better documented historical catches show that it was common for whales to stay for months in enclosed waters elsewhere, with known records in the Seto Inland Sea and the Gulf of Tosa. Former feeding areas were once spread over large portions on mid-Honshu to northern Hokkaido, and at least whales were recorded for majority of annual seasons including wintering periods at least along east coasts of Korean Peninsula and Yamaguchi Prefecture. Some recent observations indicate that historic presences of resident whales are possible: a group of two or three were observed feeding in Izu Ōshima in 1994 for almost a month, two single individuals stayed in Ise Bay for almost two months in the 1980s and in 2012, the first confirmed living individuals in Japanese EEZ in the Sea of Japan and the first of living cow-calf pairs since the end of whaling stayed for about three weeks on the coastline of Teradomari in 2014. One of the pair returned to the same coasts at the same time of the year in 2015 again. Reviewing on other cases on different locations among Japanese coasts and islands observed during 2015 indicate that spatial or seasonal residencies regardless of being temporal or permanental staying once occurred throughout many parts of Japan or on other coastal Asia. A gray whale in the water of Sakhalin. The current western gray whale population summers in the Sea of Okhotsk, mainly off Piltun Bay region at the northeastern coast of Sakhalin Island (Russian Federation). There are also occasional sightings off the eastern coast of Kamchatka (Russian Federation) and in other coastal waters of the northern Okhotsk Sea. Its migration routes and wintering grounds are poorly known, the only recent information being from occasional records on both the eastern and western coasts of Japan and along the Chinese coast. Gray whale had not been observed on Commander Islands until 2016. The Sea of Japan was once thought not to have been a migration route, until several entanglements were recorded. Any records of the species had not been confirmed since after 1921 on Kyushu. However, there were numerous records of whales along the Genkai Sea off Yamaguchi Prefecture, in Ine Bay in the Gulf of Wakasa, and in Tsushima. Gray whales, along with other species such as right whales and Baird's beaked whales, were common features off the north eastern coast of Hokkaido near Teshio, Ishikari Bay near Otaru, the Shakotan Peninsula, and islands in the La Pérouse Strait such as Rebun Island and Rishiri Island. These areas may also have included feeding grounds. There are shallow, muddy areas favorable for feeding whales off Shiretoko, such as at Shibetsu, the Notsuke Peninsula, Cape Ochiishi on Nemuro Peninsula, Mutsu Bay, along the Tottori Sand Dunes, in the Suou-nada Sea, and Ōmura Bay. The historical calving grounds were unknown but might have been along southern Chinese coasts from Zhejiang and Fujian Province to Guangdong, especially south of Hailing Island and to near Hong Kong. Possibilities include Daya Bay, Wailou Harbour on Leizhou Peninsula, and possibly as far south as Hainan Province and Guangxi, particularly around Hainan Island. These areas are at the southwestern end of the known range. It is unknown whether the whales' normal range once reached further south, to the Gulf of Tonkin. In addition, the existence of historical calving ground on Taiwan and Penghu Islands (with some fossil records and captures), and any presence in other areas outside of the known ranges off Babuyan Islands in Philippines and coastal Vietnamese waters in Gulf of Tonkin are unknown. There is only one confirmed record of accidentally killing of the species in Vietnam, at Ngoc Vung Island off Ha Long Bay in 1994 and the skeleton is on exhibition at the Quang Ninh Provincial Historical Museum. Gray whales are known to occur in Taiwan Strait even in recent years. It is also unknown whether any winter breeding grounds ever existed beyond Chinese coasts. For example, it is not known if the whales visited the southern coasts of the Korean Peninsula, adjacent to the Island of Jeju), Haiyang Island, the Gulf of Shanghai, or the Zhoushan Archipelago. There is no evidence of historical presence in Japan south of Ōsumi Peninsula; only one skeleton has been discovered in Miyazaki Prefecture. Hideo Omura [jp] once considered the Seto Inland Sea to be a historical breeding ground, but only a handful of capture records support this idea, although migrations into the sea have been confirmed. Even though South Korea put the most effort into conservation of the species among the Asian nations, there are no confirmed sightings along the Korean Peninsula or even in the Sea of Japan in recent years. The last record in Korean waters was the sighting of a pair off Bangeojin, Ulsan in 1977. Prior to this, the last was of catches of 5 animals off Ulsan in 1966. There had been 24 records along Chinese coasts including sighting, stranding, intended hunts, and bycatches since 1933. The last report of occurrence of the species in Chinese waters was of a stranded semi adult female in the Bohai Sea in 1996, and the only record in Chinese waters in the 21st century was of a fully-grown female being killed by entanglement in Pingtan, China in November, 2007. DNA studies indicated that this individual might have originated from the eastern population rather than the western. Most notable observations of living whales after the 1980s were of 17 or 18 whales along Primorsky Krai in late October, 1989 (prior to this, a pair was reported swimming in the area in 1987), followed by the record of 14 whales in La Pérouse Strait on 13th, June in 1982 (in this strait, there was another sighting of a pair in October, 1987). In 2011, presences of gray whales were acoustically detected among pelagic waters in East China Sea between Chinese and Japanese waters. The feeding activities of a group of two or three whales that stayed around Izu Ōshima in 1994 for almost a month were recorded underwater by several researchers and whale photographers. A pair of thin juveniles were sighted off Kuroshio, Kōchi, a renowned town for whale-watching tourism of resident and sub-resident populations of Bryde's Whales, in 1997. This sighting was unusual because of the location on mid-latitude in summer time. Another pair of sub-adults were confirmed swimming near the mouth of Otani River in Suruga Bay in May, 2003. A sub-adult whale that stayed in the Ise and Mikawa Bay for nearly two months in 2012 was later confirmed to be the same individual as the small whale observed off Tahara near Cape Irago in 2010, making it the first confirmed constant migration out of Russian waters. The juvenile observed off Owase in Kumanonada Sea in 2009 might or might not be the same individual. The Ise and Mikawa Bay region is the only location along Japanese coasts that has several records since the 1980s (a mortal entanglement in 1968, above mentioned short-stay in 1982, self-freeing entanglement in 2005), and is also the location where the first commercial whaling started. Other areas with several sighting or stranding records in recent years are off the Kumanonada Sea in Wakayama, off Oshika Peninsula in Tōhoku, and on coastlines close to Tomakomai, Hokkaido. Possibly the first confirmed record of living animals in Japanese waters in the Sea of Japan since the end of whaling occurred on 3 April 2014 at Nodumi Beach, Teradomari, Niigata. Two individuals, measuring ten and five metres respectively, stayed near the mouth of Shinano River for three weeks. It is unknown whether this was a cow-calf pair, which would have been a first record in Asia. All of the previous modern records in the Sea of Japan were of by-catches. One of the above pair returned on the same beaches at the same time of a year in 2015. A juvenile or possibly or not with another larger individual remained in Japanese waters between January or March and May 2015. It was first confirmed occurrences of the species on remote, oceanic islands in Japan. One or more visited waters firstly on Kōzu-shima and Nii-Jima for weeks then adjacent to Miho no Matsubara and behind the Tokai University campus for several weeks. Possibly the same individual was seen off Futo as well. This later was identified as the same individual previously recorded on Sakhalin in 2014, the first re-recording one individual at different Asian locations. A young whale was observed by land-based fishermen at Cape Irago in March, 2015. One of the above pair appeared in 2015 off southeastern Japan and then reappeared off Tateyama in January, 2016. The identity of this whale was confirmed by Nana Takanawa who photographed the same whale on Niijima in 2015. Likely the same individual was sighted off Futo and half an hour later off Akazawa beach in Itō, Shizuoka on the 14th. The whale then stayed next to a pier on Miyake-jima and later at Habushi beach on Niijima, the same beach the same individual stayed near on the previous year. One whale of 9 metres (30 ft) was beached nearby Wadaura on March 4, 2016. Investigations on the corpse indicate that this was likely a different individual from the above animal. A 7 metres (23 ft) carcass of young female was firstly reported floating along Atami on 4 April then was washed ashore on Ito on the 6th. As of April 20, 2017, one or more whale(s) have been staying within Tokyo Bay since February although at one point another whale if or if not the same individual sighted off Hayama, Kanagawa. It is unclear the exact number of whales included in these sightings; two whales reported by fishermen and Japanese coastal guard reported three whales on 20th or 21st. Humans and killer whales (orcas) are the adult gray whale's only predators, although orcas are the more prominent predator. Aboriginal hunters, including those on Vancouver Island and the Makah in Washington, have hunted gray whales. Commercial whaling by Europeans of the species in the North Pacific began in the winter of 1845–46, when two United States ships, the Hibernia and the United States, under Captains Smith and Stevens, caught 32 in Magdalena Bay. More ships followed in the two following winters, after which gray whaling in the bay was nearly abandoned because "of the inferior quality and low price of the dark-colored gray whale oil, the low quality and quantity of whalebone from the gray, and the dangers of lagoon whaling." Gray whaling in Magdalena Bay was revived in the winter of 1855–56 by several vessels, mainly from San Francisco, including the ship Leonore, under Captain Charles Melville Scammon. This was the first of 11 winters from 1855 through 1865 known as the "bonanza period", during which gray whaling along the coast of Baja California reached its peak. Not only were the whales taken in Magdalena Bay, but also by ships anchored along the coast from San Diego south to Cabo San Lucas and from whaling stations from Crescent City in northern California south to San Ignacio Lagoon. During the same period, vessels targeting right and bowhead whales in the Gulf of Alaska, Sea of Okhotsk, and the Western Arctic would take the odd gray whale if neither of the more desirable two species were in sight. In December 1857, Charles Scammon, in the brig Boston, along with his schooner-tender Marin, entered Laguna Ojo de Liebre (Jack-Rabbit Spring Lagoon) or later known as Scammon's Lagoon (by 1860) and found one of the gray's last refuges. He caught 20 whales. He returned the following winter (1858–59) with the bark Ocean Bird and schooner tenders A.M. Simpson and Kate. In three months, he caught 47 cows, yielding 1,700 barrels (270 m3) of oil. In the winter of 1859–60, Scammon, again in the bark Ocean Bird, along with several other vessels, entered San Ignacio Lagoon to the south where he discovered the last breeding lagoon. Within only a couple of seasons, the lagoon was nearly devoid of whales. Between 1846 and 1874, an estimated 8,000 gray whales were killed by American and European whalemen, with over half having been killed in the Magdalena Bay complex (Estero Santo Domingo, Magdalena Bay itself, and Almejas Bay) and by shore whalemen in California and Baja California. A second, shorter, and less intensive hunt occurred for gray whales in the eastern North Pacific. Only a few were caught from two whaling stations on the coast of California from 1919 to 1926, and a single station in Washington (1911–21) accounted for the capture of another. For the entire west coast of North America for the years 1919 to 1929, 234 gray whales were caught. Only a dozen or so were taken by British Columbian stations, nearly all of them in 1953 at Coal Harbour. A whaling station in Richmond, California, caught 311 gray whales for "scientific purposes" between 1964 and 1969. From 1961 to 1972, the Soviet Union caught 138 gray whales (they originally reported not having taken any). The only other significant catch was made in two seasons by the steam-schooner California off Malibu, California. In the winters of 1934–35 and 1935–36, the California anchored off Point Dume in Paradise Cove, processing gray whales. In 1936, gray whales became protected in the United States. The Japanese began to catch gray whales beginning in the 1570s. At Kawajiri, Nagato, 169 gray whales were caught between 1698 and 1889. At Tsuro, Shikoku, 201 were taken between 1849 and 1896. Several hundred more were probably caught by American and European whalemen in the Sea of Okhotsk from the 1840s to the early 20th century. Whalemen caught 44 with nets in Japan during the 1890s. The real damage was done between 1911 and 1933, when Japanese whalemen killed 1,449 after Japanese companies established several whaling stations on Korean Peninsula and on Chinese coast such as near the Daya bay and on Hainan Island. By 1934, the western gray whale was near extinction. From 1891 to 1966, an estimated 1,800–2,000 gray whales were caught, with peak catches of between 100 and 200 annually occurring in the 1910s. As of 2001, the Californian gray whale population had grown to about 26,000. 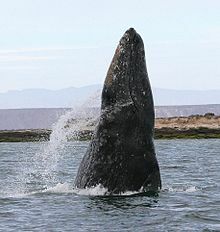 As of 2011, the population of western Pacific (seas near Korea, Japan, and Kamchatka) gray whales was an estimated 130. The North Atlantic population may have been hunted to extinction in the 18th century. Circumstantial evidence indicates whaling could have contributed to this population's decline, as the increase in whaling activity in the 17th and 18th centuries coincided with the population's disappearance. A. B. Van Deinse points out the "scrag whale", described by P. Dudley in 1725, as one target of early New England whalers, was almost certainly the gray whale. In his 1835 history of Nantucket Island, Obed Macy wrote that in the early pre-1672 colony, a whale of the kind called "scragg" entered the harbor and was pursued and killed by the settlers. Gray whales (Icelandic sandlægja) were described in Iceland in the early 17th century. Formations of industrial whaling among the Mediterranean basin(s) have been considered to be feasible as well. Joint American-Russian freeing effort of whales entrapped by ice floe in Beaufort Sea. Gray whales have been granted protection from commercial hunting by the International Whaling Commission (IWC) since 1949, and are no longer hunted on a large scale. Limited hunting of gray whales has continued since that time, however, primarily in the Chukotka region of northeastern Russia, where large numbers of gray whales spend the summer months. This hunt has been allowed under an "aboriginal/subsistence whaling" exception to the commercial-hunting ban. Anti-whaling groups have protested the hunt, saying the meat from the whales is not for traditional native consumption, but is used instead to feed animals in government-run fur farms; they cite annual catch numbers that rose dramatically during the 1940s, at the time when state-run fur farms were being established in the region. Although the Soviet government denied these charges as recently as 1987, in recent years the Russian government has acknowledged the practice. The Russian IWC delegation has said that the hunt is justified under the aboriginal/subsistence exemption, since the fur farms provide a necessary economic base for the region's native population. Currently, the annual quota for the gray whale catch in the region is 140 per year. Pursuant to an agreement between the United States and Russia, the Makah tribe of Washington claimed four whales from the IWC quota established at the 1997 meeting. With the exception of a single gray whale killed in 1999, the Makah people have been prevented from hunting by a series of legal challenges, culminating in a United States federal appeals court decision in December 2002 that required the National Marine Fisheries Service to prepare an Environmental Impact Statement. On September 8, 2007, five members of the Makah tribe shot a gray whale using high-powered rifles in spite of the decision. The whale died within 12 hours, sinking while heading out to sea. As of 2008, the IUCN regards the gray whale as being of "Least Concern" from a conservation perspective. However, the specific subpopulation in the northwest Pacific is regarded as being "Critically Endangered". The northwest Pacific population is also listed as endangered by the U.S. government’s National Marine Fisheries Service under the U.S. Endangered Species Act. The IWC Bowhead, Right and Gray Whale subcommittee in 2011 reiterated the conservation risk to western gray whales is large because of the small size of the population and the potential anthropogenic impacts. Gray whale migrations off of the Pacific Coast were observed, initially, by Marineland of the Pacific in Palos Verdes, California. The Gray Whale Census, an official Gray Whale migration census that has been recording data on the migration of the Pacific Gray Whale has been keeping track of the population of the Pacific Gray Whale since 1985. This census is the longest running census of the Pacific Gray Whale. Census keepers volunteer from December 1 through May, from sun up to sun down, seven days a week, keeping track of the amount of Gray Whales migrating through the area off of Los Angeles. Information from this census is listed through the American Cetacean Society of Los Angeles (ACSLA). South Korea and China list gray whales as protected species of high concern. In South Korea, the Gray Whale Migration Site [ko] was registered as the 126th national monument in 1962, although illegal hunts had been taken place thereafter, and there have been no recent sightings of the species in Korean waters. In 2005, two conservation biologists proposed a plan to airlift 50 gray whales from the Pacific Ocean to the Atlantic Ocean. They reasoned that, as Californian gray whales had replenished to a suitable population, surplus whales could be transported to repopulate the extinct British population. As of 2017[update] this plan has not been undertaken. According to the Government of Canada's Management Plan for gray whales, threats to the eastern North Pacific population of gray whales include: increased human activities in their breeding lagoons in Mexico, climate change, acute noise, toxic spills, aboriginal whaling, entanglement with fishing gear, boat collisions, and possible impacts from fossil fuel exploration and extraction. Western gray whales are facing, the large-scale offshore oil and gas development programs near their summer feeding ground, as well as fatal net entrapments off Japan during migration, which pose significant threats to the future survival of the population. The substantial nearshore industrialization and shipping congestion throughout the migratory corridors of the western gray whale population represent potential threats by increasing the likelihood of exposure to ship strikes, chemical pollution, and general disturbance. Offshore gas and oil development in the Okhotsk Sea within 20 km (12 mi) of the primary feeding ground off northeast Sakhalin Island is of particular concern. Activities related to oil and gas exploration, including geophysical seismic surveying, pipelaying and drilling operations, increased vessel traffic, and oil spills, all pose potential threats to western gray whales. Disturbance from underwater industrial noise may displace whales from critical feeding habitat. Physical habitat damage from drilling and dredging operations, combined with possible impacts of oil and chemical spills on benthic prey communities also warrants concern. Along Japanese coasts, four females including a cow-calf pair were trapped and killed in nets in the 2000s. There had been a record of dead whale thought to be harpooned by dolphin-hunters found on Hokkaido in the 1990s. Meats for sale were also discovered in Japanese markets as well. Killer whales are "a prime predator of gray whale calves." Typically three to four killer whales ram a calf from beneath in order to separate it from its mother, who defends it. Humpback whales have been observed defending gray whale calves from orcas. Because of their size and need to migrate, gray whales have rarely been held in captivity, and then only for brief periods of time. The first captive gray whale, who was captured in Scammon's Lagoon, Baja California in 1965, was named Gigi and died two months later from an infection. The second gray whale, who was captured in 1972 from the same lagoon, was named Gigi II and was released a year later after becoming too large for the facilities. The last gray whale, J.J., first beached herself in Marina del Rey, California where she was rushed to SeaWorld San Diego. After 14 months, she was released because she also grew too large to be cared for in the existing facilities. Reaching 19,200 pounds (8,700 kg) and 31 feet (9.4 m), J.J. was the largest creature ever to be kept in captivity. ^ a b Mead, J.G. ; Brownell, R. L. Jr. (2005). "Order Cetacea". In Wilson, D.E. ; Reeder, D.M (eds.). Mammal Species of the World: A Taxonomic and Geographic Reference (3rd ed.). Johns Hopkins University Press. pp. 723–743. ISBN 978-0-8018-8221-0. OCLC 62265494. ^ Boessenecker, Robert (2007). "New records of fossil fur seals and walruses (Carnivora : Pinnipedia) from the late Neogene of Northern California". Journal of Vertebrate Paleontology. 27: 50A. ^ a b c Reilly, S.B. ; Bannister, J.L. ; Best, P.B. ; Brown, M.; Brownell Jr., R.L. ; Butterworth, D.S. ; Clapham, P.J. ; Cooke, J.; Donovan, G.P. ; Urbán, J. & Zerbini, A.N. (2008). "Eschrichtius robustus". The IUCN Red List of Threatened Species. IUCN. 2008: e.T8097A12885255. doi:10.2305/IUCN.UK.2008.RLTS.T8097A12885255.en. Retrieved 26 December 2017. ^ Britannica Micro. : v. IV, p. 693. ^ Nowak, Ronald M. (7 April 1999). Walker's Mammals of the World. JHU Press. p. 1132. ISBN 978-0-8018-5789-8. ^ Recovery Strategy for the Grey Whale (Eschrichtius robustus), Atlantic Population, in Canada. Dsp-psd.pwgsc.gc.ca (2012-07-31). Retrieved on 2012-12-20. ^ Gray Whale. Worldwildlife.org. Retrieved on 2012-12-20. ^ Perrin, William F.; Würsig, Bernd G.; Thewissen, J. G. M. (2009). Encyclopedia of marine mammals. Academic Press. p. 404. ISBN 978-0-12-373553-9. ^ a b Thomas, Pete (2010-05-10). "Gray whale off Israel called 'most amazing sighting in history of whales'". GrindTV.com. Archived from the original on 15 May 2010. Retrieved 12 May 2010. ^ Hoare, Philip (2013-05-14). "First grey whale spotted south of the Equator". The Guardian. Retrieved 17 September 2014. ^ "Gray whale travels more than 22,000 kilometres, smashes world record". The Weather Network. 2015-04-16. ^ Kimura, T.; Hasegawa, Y.; Kohno, N. (2017). "A New Species of the Genus Eschrichtius (Cetacea: Mysticeti) from the Early Pleistocene of Japan". Paleontological Research. 22 (1): 1–19. doi:10.2517/2017PR007. ^ Arnason, U.; Gullberg A. & Widegren, B. (1993). "Cetacean mitochondrial DNA control region: sequences of all extant baleen whales and two sperm whale species". Molecular Biology and Evolution. 10 (5): 960–970. PMID 8412655. ^ Sasaki, T.; Nikaido, Masato; Hamilton, Healy; Goto, Mutsuo; Kato, Hidehiro; Kanda, Naohisa; Pastene, Luis; Cao, Ying; et al. (2005). "Mitochondrial Phylogenetics and Evolution of Mysticete Whales". Systematic Biology. 54 (1): 77–90. doi:10.1080/10635150590905939. PMID 15805012. ^ Seeman, Mette E.; et al. (December 2009). "Radiation of Extant Cetaceans Driven by Restructuring of the Ocean". Systematic Biology. 58 (6): 573–585. doi:10.1093/sysbio/syp060. JSTOR 25677547. ^ Gray (1864). "Eschrichtius". Ann. Mag. Nat. Hist. 3 (14): 350. ^ Pyenson, Nicholas D.; Lindberg, David R. (2011). Goswami, Anjali (ed.). "What Happened to Gray Whales during the Pleistocene? The Ecological Impact of Sea-Level Change on Benthic Feeding Areas in the North Pacific Ocean". PLoS ONE. 6 (7): e21295. doi:10.1371/journal.pone.0021295. PMC 3130736. PMID 21754984. ^ Cope (1869). "Rhachianectes". Proc. Acad. Nat. Sci. Phila. 21: 15. ^ Cederlund, BA (1938). "A subfossil gray whale discovered in Sweden in 1859". Zoologiska Bidrag Fran Uppsala. 18: 269–286. ^ a b c Mead JG, Mitchell ED (1984). "Atlantic gray whales". In Jones ML, Swartz SL, Leatherwood S (eds.). The Gray Whale. London: Academic Press. pp. 33–53. ^ a b Bryant, PJ (1995). "Dating Remains of Gray Whales from the Eastern North Atlantic". Journal of Mammalogy. 76 (3): 857–861. doi:10.2307/1382754. JSTOR 1382754. ^ Waser, Katherine (1998). "Ecotourism and the desert whale: An interview with Dr. Emily Young". Arid Lands Newsletter. ^ "Eschrichtius robustus". Integrated Taxonomic Information System. Retrieved March 18, 2006. ^ Erxleben (1777). "Balaena gibbosa". Systema regni animalis: 610. ^ "How to Spot Whales from Shore | the whale trail". thewhaletrail.org. Retrieved 2017-02-13. ^ a b c Kato H.; Kishiro T.; Nishiwaki S.; Nakamura G.; Bando T.; Yasunaga G.; Sakamoto T.; Miyashita T. (2014). "Status Report of Conservation and Researches on the Western North Pacific Gray Whales in Japan, May 2013 - April 2014 [document SC/65b/BRG12]". Retrieved 2014-05-14. ^ a b Nakamura G.; Kato H. (2014). "日本沿岸域に近年（1990–2005 年）出現したコククジラEschrichtius robustus の骨学的特徴，特に頭骨形状から見た北太平洋西部系群と東部系群交流の可能性" (PDF). 哺乳類科学　. The Mammal Society of Japan, Cetacean Research Laboratory in Marine environmental section in the Graduate School of Tokyo University of Marine Science and Technology, J-STAGE. 54 (1): 73–88. Retrieved 2015-01-16. ^ a b Shpak O. (2011). Observation of the gray whale in the Laptev Sea. Standing expedition of IEE Russian Academy of Sciences. ^ a b c d Xianyan, Wang; Min, Xu; Fuxing, Wu; Weller, David W.; Xing, Miao; Lang, Aimee R.; Qian, Zhu (2015). "Short Note: Insights from a Gray Whale (Eschrichtius robustus) Bycaught in the Taiwan Strait Off China in 2011". Aquatic Mammals. 41 (3): 327. doi:10.1578/AM.41.3.2015.327. ^ a b c d "Report of the Scientific Committee, Tromsø, Norway, 30 May to 11 June 2011 Annex F: Sub-Committee on Bowhead, Right and Gray Whale" (PDF). IWC Office. Archived from the original (PDF) on 5 November 2011. ^ a b c d Andrew Lachman (May 8, 2018). "Unusual Number of Killer Whales Sighted". San Jose Mercury-News. Bay Area News Group. p. B1. ^ a b "Whale Conservation Success Highlighted in IUCN Red List Update". The Maritime Executive. Retrieved 2018-11-25. ^ a b c d e "Eschrichtius robustus (western subpopulation)". IUCN Red List. ^ "Fin whale, mountain gorilla populations rise amid conservation action". Retrieved 2018-11-25. ^ Rice DW (1998). Marine Mammals of the World. Systematics and Distribution. Special Publication Number 4. Lawrence, Kansas: The Society for Marine Mammalogy. ^ "Regional Species Extinctions - Examples of regional species extinctions over the last 1000 years and more" (PDF). Census of Marine Life. Archived from the original (PDF) on 2011-04-25. Retrieved 2014-07-05. ^ Macé M. (2003). "Did the Gray Whale calve in the Mediterranean?". Lattara. 16: 153–164. ^ a b Macy O (1835). The History of Nantucket:being a compendious account of the first settlement of the island by the English:together with the rise and progress of the whale fishery, and other historical facts relative to said island and its inhabitants:in two parts. Boston: Hilliard, Gray & Co. ISBN 1-4374-0223-2. ^ a b Van Deinse, AB (1937). "Recent and older finds of the gray whale in the Atlantic". Temminckia. 2: 161–188. ^ a b Dudley, P (1725). "An essay upon the natural history of whales". Philosophical Transactions of the Royal Society. 33 (381–391): 256–259. doi:10.1098/rstl.1724.0053. JSTOR 103782. ^ Alter, SE; Newsome, SD; Palumbi, SR (May 2012). "Pre-Whaling Genetic Diversity and Population Ecology in Eastern Pacific Gray Whales: Insights from Ancient DNA and Stable Isotopes". PLOS ONE. 7 (5): e35039. doi:10.1371/journal.pone.0035039. PMC 3348926. PMID 22590499. Retrieved June 12, 2016. ^ "Gray Whale Population Studies". NOAA, National Marine Fisheries Service, Southwest Fisheries Science Center, Protected Resource Division. 2010. Retrieved 2011-02-25. ^ "Automatic Whale Detector". NOAA, National Marine Fisheries Service, Southwest Fisheries Science Center, Protected Resource Division. 2015. Archived from the original on 2016-02-23. Retrieved 2016-01-17. ^ "Western Pacific Gray Whale, Sakhalin Island 2010". Oregon State University, Marine Mammal Institute. February 2011. Retrieved 2011-02-25. ^ Rugh, David J.; Fraker, Mark A. (June 1981). "Gray Whale (Eschrichtius robustus) Sightings in Eastern Beaufort Sea" (PDF). Arctic. 34 (2). doi:10.14430/arctic2521. Retrieved 2010-07-15. ^ Shpak V.O. ; Kuznetsova M.D. ; Rozhnov V.V. (2013). "Observation of the Gray Whale (Eschrichtius robustus) in the Laptev Sea". Biology Bulletin. 40 (9): 797–800. doi:10.1134/S1062359013090100. ^ צפריר רינת 08.05.2010 16:47 עודכן ב: 16:50. "לווייתן אפור נצפה בפעם הראשונה מול חופי ישראל – מדע וסביבה – הארץ". Haaretz.co.il. Archived from the original on 2010-05-11. Retrieved 2012-06-26. ^ "Satellites witness lowest Arctic ice coverage in history". European Space Agency. Retrieved 2007-09-14. ^ Walker, Matt (30 May 2010). "Mystery gray whale sighted again off Spain coast". BBC News. Retrieved 8 June 2010. ^ Namibian Dolphin Project: A rare and mysterious visitor in Walvis Bay. Namibiandolphinproject.blogspot.ch (2013-05-14). Retrieved on 2013-07-28. ^ a b Alter, S. Elizabeth; Meyer, Matthias; Post, Klaas; Czechowski, Paul; Gravlund, Peter; Gaines, Cork; Rosenbaum, Howard C.; Kaschner, Kristin; Turvey, Samuel T.; Van Der Plicht, Johannes; Shapiro, Beth; Hofreiter, Michael (2015). "Climate impacts on transocean dispersal and habitat in gray whales from the Pleistocene to 2100". Molecular Ecology. 24 (7): 1510. doi:10.1111/mec.13121. PMID 25753251. ^ a b c d Rice, D.; Wolman, A. & Braham, H. (1984). "The Gray Whale, Eschrichtius robustus" (PDF). Marine Fisheries Review. 46 (4): 7–14. ^ a b c Jones, Mary Lou. "The Reproductive Cycle in Gray Whales Based on Photographic Resightings of Females on the Breeding Grounds from 1977–82" (PDF). Rep. Int. Whal. Comm. (t2): 177. Archived from the original (PDF) on 2012-04-26. ^ a b c Swartz, Steven L.; Taylor, Barbara L.; Rugh, David J. (2006). "Gray whale Eschrichtius robustus population and stock identity" (PDF). Mammal Review. 36 (1): 66–84. doi:10.1111/j.1365-2907.2006.00082.x. Archived from the original (PDF) on 2012-04-26. ^ Solutions, Gray Whale Foundation | Rosodigital Creative. "The Gray Whale Foundation". www.graywhalefoundation.org. Retrieved 2018-02-02. ^ "GRAY WHALE: ZoomWhales.com". Enchantedlearning.com. Retrieved 2012-06-26. ^ a b Weller, D.W.; Wursig, B.; Bradford, A.L. ; Burdin, A.M.; Blokhin, S.A.; inakuchi, H. & Brownell, R.L. Jr. (1999). "Gray whales (Eschrichtius robustus) off Sakhalin Island, Russia: seasonal and annual patterns of occurrence". Mar. Mammal Sci. 15 (4): 1208–27. doi:10.1111/j.1748-7692.1999.tb00886.x. ^ Fadeev V.I. (2003). Benthos and prey studies in feeding grounds of the Okhotsk-Korean population of gray whales Archived 2017-01-06 at the Wayback Machine. Final report on materials from field studies on the research vessel Nevelskoy in 2002. Marine Biology Institute, Vladivostok. ^ a b Reeves, R.R., Brownell Jr., R.L., Burdin, A., Cooke, J.G., Darling, J.D., Donovan, G.P., Gulland, F.M.D., Moore, S.E., Nowacek, D.P., Ragen, T.J., Steiner, R.G., Van Blaricom, G.R., Vedenev, A. and Yablokov, A.V. (2005). Report of the Independent Scientific review Panel on the Impacts of Sakhalin II Phase 2 on Western Pacific Gray Whales and Related Biodiversity. IUCN, Gland Switzerland, and Cambridge, U.K.
^ Davis, T.N. (1979-09-06). "Recovery of the Gray Whale". Alaska Science Forum. Archived from the original on 2009-02-12. Retrieved 2009-01-25. ^ Niemann, G. (2002). Baja Legends. Sunbelt Publications. pp. 171–173. ISBN 0-932653-47-2. ^ Findley, T.L. ; Vidal, O. (2002). "Gray whale (Eschrichtius robustus) at calving sites in the Gulf of California, México". Journal of Cetacean Research and Management. 4 (1): 27–40. ^ Lang, A. (January 19, 2011). "Demographic distinctness of the Pacific Coast Feeding Group of Gray Whales (Eschrictius robustus)". NOAA Fisheries Service, Protected Resource Division, Southwest Fisheries Science Center. Retrieved 2011-02-25. ^ a b c d "A Gray Area: On the Matter of Gray Whales in the Western North Pacific". Researchgate.net. 2015-05-07. Retrieved 2017-01-06. ^ a b c d e Nambu, Hisao; Ishikawa, Hajime & Yamada, Tadasu K. (2010). "Records of the western gray whale, Eschrichtius robustus: its distribution and migration" (PDF). Japan Cetology. 20: 21–29. Archived from the original (PDF) on 2016-03-04. Retrieved 2015-10-15. ^ a b c "連鎖の崩壊　第３部 命のふるさと ２−四国新聞社". Retrieved 14 May 2015. ^ a b Suitube (2012). "中村宏治 コククジラ撮影秘話！". Japan Underwater Films. p. YouTube. Retrieved 2015-01-07. ^ "コククジラが三河湾を回遊／絶滅恐れ、３月に１頭". 四国新聞社. Retrieved 14 May 2015. ^ "サービス終了のお知らせ". Archived from the original on 24 April 2014. Retrieved 14 May 2015. ^ a b "Nearly extinct western gray whale sighted again in coastal waters off Niigata". Asahi. 2015. Archived from the original on 2016-03-04. ^ a b Weller, D. W.; Takanawa, N.; Ohizumi, H.; Funahashi, N.; Sychenko, O. A.; Burdin, A. M.; Lang, A. R.; Brownell Jr., R. L. (2015). "Photographic match of a western gray whale between Sakhalin Island, Russia, and the Pacific Coast of Japan. Paper SC/66a/BRG/17". International Whaling Commission, Scientific Committee (SC66a meeting). San Diego, USA. ^ Vladimirov, V.L. (1994). "Recent distribution and abundance level of whales in Russian Far-Eastern seas". Russian J. Mar. Biol. 20: l–9. ^ a b Nambu, Hisao; Minowa, Kazuhiro; Tokutake, Kouji & Yamada, Tadasu K. (2014). "New observations on Gray whales, Eschrichtius robustus, from Central Japan, Sea of Japan" (PDF). Japan Cetology. 24: 11–14. Archived from the original (PDF) on 2016-03-04. Retrieved 2015-10-15. ^ a b "珍客コククジラ　静岡沖で潮吹き". geocities.jp. ^ Brownell, R.L. Jr.; Chun, C. (1977). "Probable existence of the Korean stock of the gray whale (Eschrichtius robustus)". J. Mammal. 58 (2): 237–9. doi:10.2307/1379584. JSTOR 1379584. ^ Tsai, Cheng-Hsiu; Fordyce, R. Ewan; Chang, Chun-Hsiang; Lin, Liang-Kong (2014). "Quaternary Fossil Gray Whales from Taiwan". Paleontological Research. 18 (2): 82. doi:10.2517/2014PR009. ^ "濒危物种数据库 - 灰鲸 Eschrichtius robustus (Lilljeborg, 1861)". 中华人民共和国濒危物种科学委员会. p. the CITES. Archived from the original on 2014-12-25. Retrieved 2014-11-24. ^ "海棲哺乳類情報データベース". Archived from the original on 3 September 2015. Retrieved 14 May 2015. ^ Kim W.H., Sohn H.; An Y-R.; Park J.K.; Kim N.D.; Doo Hae An H.D. (2013). "Report of Gray Whale Sighting Survey off Korean waters from 2003 to 2011". Cetacean Research Institute, National Fisheries Research & Development Institute. Retrieved 2014-05-18. ^ "JAPAN UNDERWATER FILMS". Retrieved 14 May 2015. ^ "footage". Beachland.jp. Retrieved 2017-01-06. ^ "伊勢湾でクジラ発見！！". Beachland.jp. Retrieved 2017-01-06. ^ ""プリン展"から"コククジラ展"へ". www.beachland.jp. Retrieved 2017-01-06. ^ Birdnetmaster (2015). "2014年 日本海に出現したコククジラ / Grey whale 2014 Sea of Japan". YouTube. Retrieved 2015-10-14. ^ Aoyagi A.; Okuda J.; Nambu H.; Honma Y.; Yamada K. T.; Satou T.; Ohta M.; Ohara J.; Imamura M. (2014). "2014年春に新潟県信濃川大河津分水路河口付近に出現したコククジラの観察" (PDF). Japan Cetology (24)(2014): 15–22. Archived from the original (PDF) on 2016-02-05. Retrieved 2015-10-14. ^ "寺泊沖にクジラ現る・長岡　「生きたまま初めて見た」地元驚き". The 47NEWS. Retrieved 14 May 2015. ^ Itou K. (2015). "絶滅危惧のコククジラ、２年連続で現れた　新潟・長岡". The Asahi Shimbun. Retrieved 2015-10-13. ^ Takanawa N. (2015). "【フォトギャラリー】伊豆諸島で見つかった希少なコククジラ". Japanese office of the National Geographic. Retrieved 2015-10-14. ^ "コククジラ in 日本（超貴重）Western Gray Whale sightings (Extremely Rare!)". YouTube. 2015. Retrieved 2015-10-14. ^ a b "ダイビング中にコククジラと遭遇のミラクル！ ～房総半島・西川名と伊豆半島・赤沢で相次ぐ～ ｜ オーシャナ". Oceana.ne.jp. 2016-01-19. Retrieved 2017-01-06. ^ "Ryo Okamoto - 伊良湖岬で釣りしてたら、クジラ出現。..." Facebook. 2015-03-23. Retrieved 2017-01-06. ^ "今日のコククジラ 館山 西川名 201601f". YouTube. 2016-01-09. Retrieved 2017-01-06. ^ "赤沢 コククジラ 2016.1.14". YouTube. Retrieved 2017-01-06. ^ "伊豆のダイビングサービス | ダイビングサービス mieux -みう- | クジラが～！！". Ds-mieux.com. Retrieved 2017-01-06. ^ "動画っす(｀_´)ゞ - ダイビングサービス mieux - みう". Facebook. 2016-01-13. Retrieved 2017-01-06. ^ "Gray Whales, Eschrichtius robustus". MarineBio.org. Retrieved 2018-12-13. ^ a b c d e Henderson, David A. (1972). Men & Whales at Scammon’s Lagoon. Los Angeles: Dawson’s Book Shop. ^ Scammon, Charles Melville, and David A. Henderson (1972). Journal aboard the bark Ocean Bird on a whaling voyage to Scammon’s Lagoon, winter of 1858–59. Los Angeles: Dawson’s Book Shop. ^ Tønnessen, Johan; Arne Odd Johnsen (1982). The History of Modern Whaling. University of California Press, Berkeley. ISBN 0-520-03973-4. ^ Brownell Jr., R. L. and Swartz, S. L. 2006. The floating factory ship California operations in Californian waters, 1932–1937. International Whaling Commission, Scientific Committee. ^ Kasuya, T. (2002). "Japanese whaling", in Encyclopedia of Marine Mammals. W. F. Perrin, B. Wursig, and J.G.M. Thewissen, eds. San Diego: Academic Press, pp. 655–662, ISBN 978-0-12-373553-9. ^ a b c Weller, D.; et al. (2002). "The western gray whale: a review of past exploitation, current status and potential threats". 4 (1). J. Cetacean Res. Manage: 7–12. ^ Jón Guðmundsson lærði (1966). Ein stutt udirrietting um Íslands adskiljanlegu náttúrur. ed. Halldór Hermannsson, Cornell University Library, Ithaca, New York. ^ Mapes, Lynda V.; Ervin, Keith (2007-09-09). "Gray whale shot, killed in rogue tribal hunt". The Seattle Times. Archived from the original on 2011-11-25. ^ "- 문화재검색결과 상세보기 - 문화재검색". Retrieved 14 May 2015. ^ "Gray Whale Migration Site (울산 귀신고래 회유해면)". Official Korea Tourism Organization. ^ Hooper, Rowan (23 July 2005). "Moving Whales Across the World". New Scientist. Retrieved 22 August 2013. ^ Hooper, Rowan (18 July 2005). "US whales may be brought to UK". BBC News. Retrieved 22 August 2013. ^ Monbiot, George (2013). Feral: Searching for Enchantment on the Frontiers of Rewilding. Allen Lane. ISBN 978-1-846-14748-7. ^ "Eschrichtius robustus (western subpopulation". IUCN. Retrieved 2015-01-13. ^ Yamada T.; Watanabe Y. "Marine Mammals Stranding DataBase - Gray Whale". The National Museum of Nature and Science. Archived from the original on 2014-05-12. Retrieved 2015-01-13. ^ Baker, C. S.; Dalebout, M. L.; Lento, G. M.; Funahashi, Naoko (2002). "Gray Whale Products Sold in Commercial Markets Along the Pacific Coast of Japan". Marine Mammal Science. 18: 295. doi:10.1111/j.1748-7692.2002.tb01036.x. ^ Hubbs, Carl L.; Evans, William E. (1974). "The California gray whale : papers presented at the California Gray Whale Workshop, Scripps Institution of Oceanography". Marine Fisheries Review. 36 (4). ^ Sumich, J. L.; Goff, T.; L. Perryman, W. (2001). "Growth of two captive gray whale calves" (PDF). Aquatic Mammals. 27 (3): 231–233. ^ Perry, Tony (1998). "Rescued Whale J.J. Begins Long Journey Home". LA Times. Retrieved 29 January 2016. Jones, Mary Lou; Swartz, Steven L.; Leatherwood, Stephen (1984). The Gray whale: Eschrichtius robustus. Academic Press. p. 600. ISBN 9780123891808. Rice, Dale W.; Wolman, Allen A. (April 30, 1971). The Life History and Ecology of the Gray Whale: Eschrichtius Robustus, Special Publication No. 3. The American Society of Mammalogists. p. 152. Swartz, Steven L.; Jones, Mary Lou (June 1987). "Gray Whales". National Geographic. Vol. 171 no. 6. pp. 754–771. ISSN 0027-9358. OCLC 643483454. Sumich, James (2014). E. robustus: The biology and human history of gray whales (1st ed.). Whale Cove Marine Education. p. 199. ISBN 9780692225424. Wikimedia Commons has media related to Gray whale.